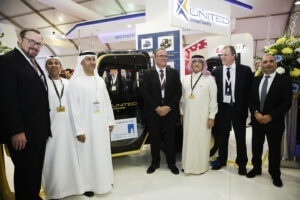 Abu Dhabi, United Arab Emirates – United Safety in association with Al Hosn Gas will unveil the Air Qruise™ Electro-Ex, an explosion-proof vehicle designed for use in Immediately Dangerous to Life and Health (IDLH) environments at ADIPEC 2014. Al Hosn Gas is the first company to make use of the Air Qruise™ technology for its Shah Gas Field. “Al Hosn Gas is committed to becoming the world’s leading company in developing sour gas resources. Given the complexity of the Shah Gas Field, we are actively seeking innovative and creative solutions for possible safety gaps as an added layer of protection for our workforce,” states Al Hosn Gas CEO Saif Ahmed Al Ghafli. With the advances in oilfield technologies and processes, sour gas field development is now being pursued in the Middle East. These fields offer vast Oil and Gas production opportunities, but they also come with considerably increased HSE risks. Safety innovations are key to cope with the increasing challenges of sour gas. “Since we launched the Air Qruise™ Trooper last year, we received a number of investigative queries on the technology. There were two main concerns we needed to address, air toxicity and flammability. We are proud to announce that just a year later, our innovation team has come up with a solution,” says Dr. Elie Daher, EVP and Chief Marketing Officer for United Safety. The Air Qruise™ integrates state-of-the-art gas detection electronics, a highly compact air supply system and rapid deployment breathing masks. This unique combination ensures that even when mobile, personnel are immediately alerted to a gas leak while being supplied with breathing air and transported out of the toxic release site. “The Electro-Ex employs the same Air Qruise™ technology but comes in an electric vehicle that ensures maximum safety in IDLH atmospheres. We combined explosion-proof mobility with breathing air delivery and gas monitoring systems to allow personnel to work safely and transit through hazardous environments,” Dr. Daher explains. The Air Qruise™ Electro-Ex can be used in chemical and petrochemical plants, upstream facilities and many other sectors with potential IDLH areas. It is ideal to transport equipment for daily operations and maintenance, carry plant operators and supervisors for routine inspections, move field personnel or medical responders to remote work sites.